You know those video games that you only play for the bosses? You slough through the “normal” levels not because you particularly enjoy them, but because the bosses thus far have been entertaining, and you’re willing to grapple with the rest of the game just to get the chance to fight the rest of them. 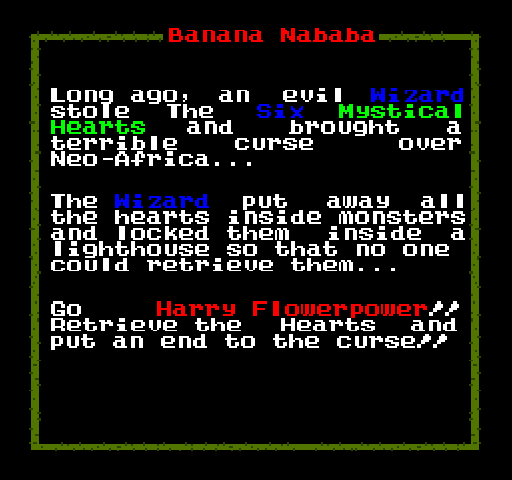 Well, Banana Nababa knows what it’s good for: bosses. The game is literally nothing but bosses. And that’s fantastic. The game’s intro, very NES-esque. Banana Nababa is a 2D platformer that was released in 2007 by a guy called Lazrael. There’s some throwaway plot about a wizard putting magical MacGuffins into a bunch of bosses inside a tower, but despite how curious I am as to what exactly happened to Africa in this bizarre future, it’s not important. You play as Harry Flowerpower, a blocky little orange dude who throws either axes, which fly upward in an arc, or spears, which fly forward. You can switch between these at will in order to better deal with different situations, and there’s no ammo, so you’re only limited by how quickly you can repeatedly bash the attack button. The game features only six stages, but for what little quantity it offers, the quality is enough to make it memorable. 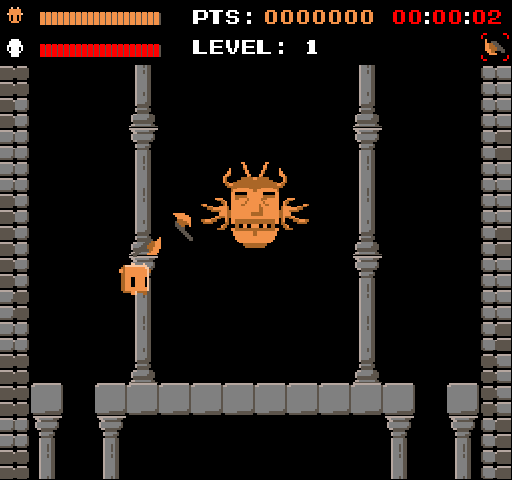 The first boss you’ll face is a floating Voodoo Mask that has three forms. No, that’s not a typo. Yes, the first boss has three forms. It starts off so simply. Later bosses have less forms, but are no less interesting to play with. They each have their own gimmicks and patterns to deal with, which ultimately make each stage feel completely different than the last. Flames pan across the floor, bullets fly, lasers zoom in and out of the screen, and so on and so forth. 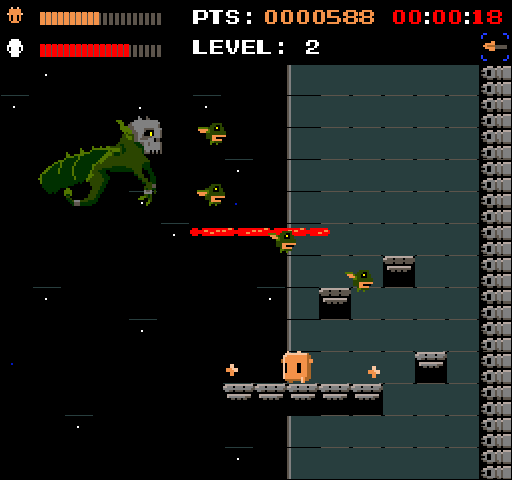 For example, in the second boss, you’ll have to contend with an endless stream of miniature monsters, killing them to collect health drops in what may boil down to a war of attrition. Meanwhile, the third boss steadily covers the floor with gel that disables your ability to walk and attack, forcing you to find a balance between dealing him damage and clearing the stage of obstacles. I got the crap beat out of me because I was trying to get a good snapshot. Honestly, that’s the real reason. It’s all fairly retro and simple. The sound effects work well, and the music is pretty great (it’s lifted from some artists on The Mod Archive – if you’re like me, you’ll be listening to it long after the game is over). As I stated before, the game only has six stages, but it does offer a bit of replay value for the criminally insane by way of high scores and best times for each boss. Other players may just come back to it from time to time for a fun diversion, as it stands on its own without the need for unlockable extras or achievements. The controls are pretty tight, simple, and easy to understand, and everything you need to know beside the controls is pretty well conveyed through good design rather than text, which is great. However, the game isn’t without its shortcomings. I’ve seen some complaints about how the player character moves a bit sluggishly. While this is certainly true, and it may be a hurdle for some, I feel that it’s just one of those mechanics to which one must acclimate in order to appreciate the game. Not all platformers play the same way. I’m sure that there are people out there who hated Cave Story for how floaty the jumping was, but it wasn’t technically a problem, just a stylistic difference that the game was built around. But I digress. My biggest gripe about Banana Nababa is in the fact that the attack button has no auto-firing feature. You throw one axe or spear every time you press the button. If you hold it down, you will not issue any further attacks. This means that one of your fingers (or thumbs, depending on what key/gamepad button you choose) is bound to get worn out during the lengthy bouts. I imagine that this was a deliberate decision on the part of the creator, but I’m not sure that neglecting to build in auto-firing really makes the game more challenging so much as it just makes it more frustrating. I suppose that the problem can be mitigated by playing one or two bosses before setting the game aside for a while, but if a game practically forces its player to pause and come back to avoid carpal tunnel, I would personally consider it to be a flaw in design. In any case, Banana Nababa is a fine little gem, and I would encourage you to give it a go if you’re into platformers or boss rushes. It’s fairly short and sweet. In the intervening years since its release, it seems as though many of the original download links for the game have been broken, so I’ve personally uploaded my own copy. That’s how you know I’m sincere about pushing this thing off on you. (Lazrael, if you’re out there and you object to this mirror, please let me know).